Green velvet (2 clasps) in green morocco case lettered: Horae Beatae Virginis Mariae - French Ms. C. 1470. Richard Bennett; Catalogue of manuscripts and early printed books from the libraries of William Morris, Richard Bennett, Bertram, fourth Earl of Ashburnham, and other sources, no. 50; purchased by J. Pierpont Morgan (1837-1913) with the Bennett Collection in 1902; J.P. Morgan (1867-1943). Ms. book of hours for the use of Paris (Hours of the Virgin, Office of the Dead); written and illuminated in Paris, France, ca. 1475. Decoration: 12 large miniatures, 3 small miniatures, 24 calendar illustrations. Artist: Maître François (tentatively identified with François le Barbier [or François Le Barbier] pè̀re [father], active 1455-ca. 1480; (see Mathieu Deldicque, Revue d'art, no. 183/2014-1, p. 9-18). Thromas Kren has attributed the script to Jean Dubreuil who signed the colophon of the Hours of Jacques of Langeac in 1466 (Lyons, Bibl. municipale, MS 5154, fol. 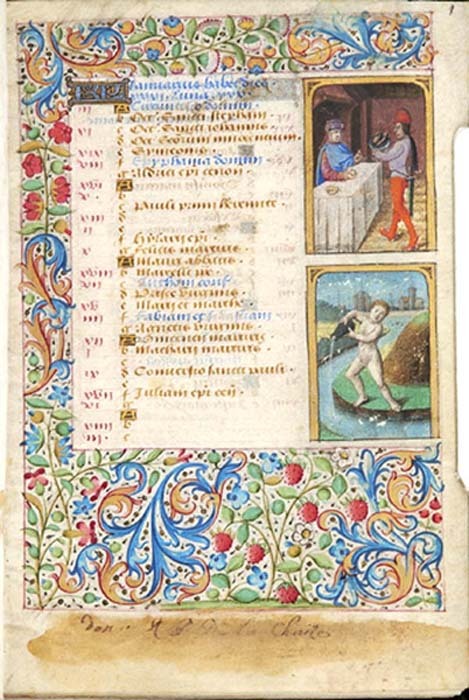 194), a manuscript also by the Maître François; (see Thomas Kren, "Seven Illuminated Books of Hours written by the Parisian scribe Jean Dubreuil, c. 1475-1485," Reading Texts and Images, 2002, p. 158).